OAKLAND, CA — What Method did for rethinking laundry detergent and how it's used, Replenish wants to do the same for household spray cleaners. Born from an idea company founder Jason Foster had while ironing more than four years ago, Replenish is introducing a line of cleaners, but is selling only empty spray bottles - which will last at least three years - and concentrated cleaner mix. Although Replenish isn't the first to make concentrated cleaners, it has developed a wholly unique bottle design and system, just as Method rethought how laundry detergent should be used with its 8x concentrated detergent that's dispensed by pumping instead of pouring. "We had a great opportunity with a blank canvas to say, 'How should you build a bottle?'" Foster said. 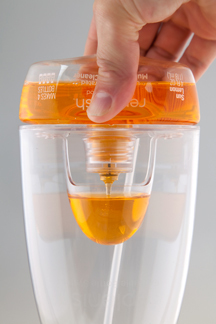 Replenish's bottle is made so that the pods of cleaner concentrate screw into the bottom of it. To make the cleaner, you turn the bottle upside down, squeeze the concentrate pod to fill up a measuring cup built into the inside of the bottle, and add water. Other concentrated cleaner brands like IQ, Ecodiscoveries and a no-longer-produced line from Arm & Hammer rely on using small bottles of concentrate, one per bottle of cleaner. Replenish's pods hold enough concentrate for four bottles and can stay attached to the bottle as long as needed. Ecodiscoveries' system involves pouring bottles of concentrate into the main bottle, and IQ's includes placing the cartidges of concentrate inside the bottle before inserting the spray nozzle. On the environmental side, Replenish's products result in 90 percent less plastic, oil and carbon dioxide emissions compared to using other cleaners over the course of a year. By shipping empty bottles, truckloads are lighter. And since the idea is for consumers to reuse one bottle over and over while buying only pods, the smaller physical footprint of the pods would lead to fewer trucks trips and other storage savings. Foster said it would take 1 semi-truck of pods to equal the amount of product in 15 semi-trucks of typical cleaners. The bottle and pods are made of PET, the commonly-recycled plastic identified by the #1 resin code, although the spray nozzle, which is also entirely plastic, is not. Since the spray nozzle doesn't contain any metal, it has a longer lifespan than ones that have metal coils, which can rust and fail. Foster estimates the life of the bottle at around three years. "Can it last longer? Absolutely," he said. "There is no designed obsolescence in this bottle." The actual length of the nozzle's life is fuzzy because when it went through a test to see how many trigger pulls it takes before the trigger fails, it lasted all the way through the test, which maxes out at 10,000 pulls. The downside to an all-plastic spray trigger is that is costs twice as much as typical spray triggers. The actual cleaner was developed with the environment in mind as well. The ingredients are 98 percent plant-derived and modified seed-oil-based cleaning agents, sugar fermented ethanol, deionized water, food grade colorants, fragrance and natural essential oil. The cleaners, Foster said, are non-toxic, readily biodegradable (meaning the majority of the product breaks down within 28 days) and pH neutral, giving them the same profile as water. As for the cost, the bottle and one pod will be sold together for $7.99 and the individual pods will sell for $3.99. Due to the concentrating that has been happening with laundry detergents, Foster doesn't expects customers to be thrown off by the $8 price tag for mostly air. He's also hoping to attract customers with the environmental aspects, as well as the convenience the bottle provides. Replenish is initially launching online at Alice.com, which creates storefronts for companies, but Foster is in negotiations to sell Replenish through some natural-focused retailers. He also received interest from bigger retailers that he wasn't expecting, he said. But for the launch, he's focusing on getting people to use the product and hoping they spread the word. "This is about building advocates and wanting to be with people who think through the products they buy," he said. Before developing Replenish, Foster was an equity research analyst, but left the field in 2004. One day while ironing, he thought about how useful it would be to have a cleaner that you can use in an iron. Then he imagined it would be a concentrated cleaner, but realized an ironing board wouldn't have enough space for a bottle of concentrate and something to mix it in. Then, he wondered what it would look like to stack the concentrate and the mixing bottle on top of one another. Foster started patent work on the system about four years ago and founded Replenish in 2008. Since the inception of the idea, he spent over $1 million in engineering the bottle. Some of that was his own savings, some came from his family and some came from angel investors. While shopping the idea around, he also ran into plenty of resistance to the idea of completely changing how cleaning products are packaged. "You couldn't ask for a better business than selling 95 percent water in bottles that people will keep buying," Foster said. He also made a number of allies, though, that helped the product along: Eastman Chemical, which supplied the PET resin and provided advice; designers who helped flesh out his idea through freelance work; Radius Product Development, the design arm of precision injection molding company Nypro; and McDonough Braungart Design Chemistry (MBDC), which helped Foster look at every aspect of the product through the lens of Cradle-to-Cradle (C2C) design. Hooking up with MBDC also helped with attracting angel investors, and Foster said Replenish is in the process of having its products evaluated for C2C certification. The actual engineering of the bottle provided the most hurdles. First off, Foster wanted to make the bottle with PET. Due to the intricate and specific design of the threading that the pods screw into, the two valves in the bottle and the built-in measuring cup, it couldn't be blow-molded like the common cleaning bottle. The parts had to be precision molded, and the base of the bottle had to be ultrasonically welded to the main part, something that hadn't been done before, Foster said. "There were all these unknowns before, and now we've worked through them," he said. Due to that, though, the bottle doesn't contain any recycled content. Foster said that due to concerns about the quality of plastic in the recycling stream, and since it was already a technological leap to do what they did with PET, Replenish is sticking with the PET resins it knows will work for now, but will be doing trials with recycled content.